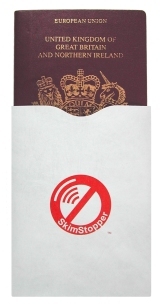 This SkimStopper product is a passport sleeve for protecting newer passports with RFID capabilities (also known as biometric passports) against the threat of data theft. It contains a special protection sheet which blocks passport readers. Many believe that the introduction of contactless chips in new passports makes their data more secure. On the contrary, research has been carried out that proves this data can be accessed with a minimal amount of effort and intelligence. With such significant security issues coming to light the Liberal Democrats and anti-ID card groups have called for a recall of these passports. The RFID-Blocking Passport Sleeve provides a cost effective solution to these concerns. This product is also a FIPS-201 approved electromagnetically opaque shield. Note: The Passport is shown for demonstration purposes only.